American soccer’s next Cincinnati is… Omaha? 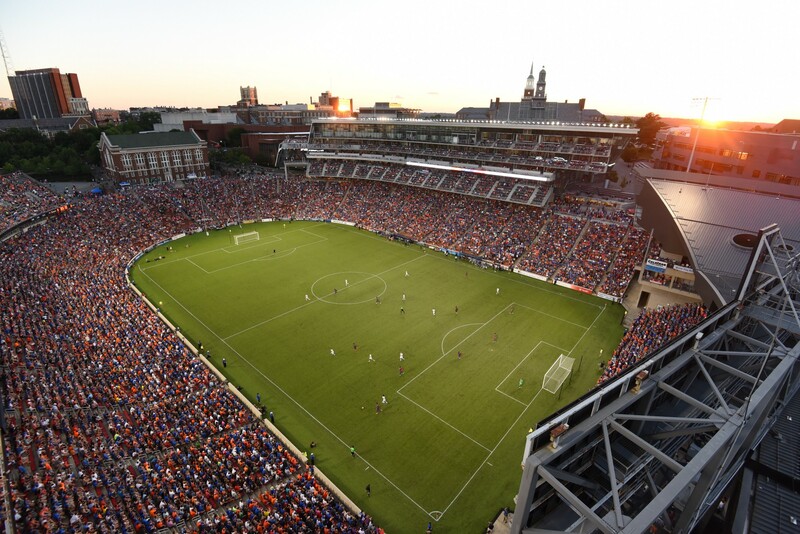 When 14,658 fans attended FC Cincinnati’s inaugural home game on April 9th, the event caught the attention of soccer followers throughout the country. Skeptics thought it was a one-off for a market that had a tough time regularly drawing even a thousand fans during its last ventures into pro soccer, from 1998 to 2003 and 2005 to 2007. Perhaps FC Cincinnati (FCC) had papered the house with free tickets. Maybe it was bottled up demand for the pro game that would fade after the novelty wore off. As a veteran soccer executive, I’ve seen it over and over: a new team arrives and people show up. It’s much harder to keep them coming back. A week later, FCC drew 20,497 fans to its home match at the University of Cincinnati’s Nippert Stadium. 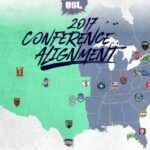 And attendance stayed strong during the entirety of the club’s inaugural season in the United Soccer League (USL). FCC ended up averaging more than 17,000 fans per game, and on October 2, the club set a USL playoff record when 30,187 fans showed up to see the home team lose to Charleston. The skeptics are now believers, and everyone wants to know if Cincinnati’s success can be replicated elsewhere. There has never been a better nexus of interest and opportunity for launching professional teams in the United States and Canada. Interest existed at a similar level in the late 1970s, thanks to Pelé and the visibility of the New York Cosmos. But the opportunity for success did not exist. NASL team owners learned this the hard way—by the downward slope of their bank balance. But now we have Cincinnati. And Portland. And Kansas City. And Sacramento. Cincinnati’s quality ownership and management team played a huge role in the team’s year-one success. They executed an excellent grassroots marketing effort and a visionary rebate sales plan. The lesson is that leadership and new ideas are important, but they have to be implemented in markets that are already ripe for soccer. What follows is an analysis of existing market characteristics that potential ownership groups should consider before they attempt to recreate Cincinnati’s fan interest elsewhere. The basic question is: Which other open markets — and there are still many without men’s professional outdoor soccer — share the criteria that provided the canvas for FCC’s year-one success? There are 1,382 Metropolitan Statistical Areas (MSAs; we’ll just call them markets from here on) in the U.S. 107 have populations greater than 500,000. And of those, almost exactly half (54) have more than a million people. Only five of the 53 markets under one million have pro soccer teams (all in the USL). Meanwhile, pro teams exist in 42 of the 54 MSAs with more than a million people. Were we to include Canada, Edmonton (pop. 1.16 million) would also make it onto the chart to the left. There are no professional soccer teams in 19 of 59 million-plus markets in the U.S. and Canada, and none in 36 of the 81 markets in the U.S. with populations of 750,000 or more. There is obviously a preference to own soccer clubs in larger markets. But there are dozens of opportunities to launch teams in smaller markets, likely in the USL. And there may even be potential in the (near?) future for a professional fourth division. If you live in a medium-sized American city and you’re wondering if your town is a good candidate for a pro soccer team, we’ll get to that. First, let’s cover the 10 criteria I use for evaluating potential markets. The larger the market, the greater the opportunity to generate revenue through ticket, suite, sponsorship, merchandise, and broadcast sales to more people, more businesses, and more media outlets. The flip side is that the largest markets come with increased expenses, competition, market clutter, and travel challenges for fans and staff. Markets with populations over three million have additional challenges in terms of breaking through the clutter to establish relevance for a professional soccer team. The potential for higher local broadcast rights fees and sponsorship from Fortune 1000 companies is tantalizing. In reality, those benefits are often offset by the fact that local media will virtually ignore the new team, and the likelihood that those additional millions of potential fans will choose an alternative sporting or entertainment option. Time is also more precious for people in big cities. It takes longer to get to work, to pick up kids, go shopping, and, yes, to go to a professional soccer game. In-person marketing and promotional efforts are more challenging in places where the population is spread out. These two factors make it difficult to create that all-important emotional connection with enough of the right people — those who are already emotionally and economically connected to the sport — who will turn into ticket buyers. It is not efficient or effective to spend time and money promoting the team to a general audience. An important aspect of big city clutter is the existence of other professional sports teams. For example, a pro soccer team going into Detroit will compete with NHL, NBA, MLB, and NFL teams for the public’s hearts, minds and wallets. On the other hand, a team trying to break into Austin — a market of two million potential fans — has no major league sports teams to compete against. That’s not to say that UT football and hoops, the Round Rock Express, the Stars, and Friday Night Lights aren’t all formidable; it’s just not the same as competing against established major professional sports leagues. Baseball is a particular obstacle because the season overlaps with the North American soccer calendar of spring to fall. During the exact time period a pro soccer team is trying to earn the loyalty and passion of a community, a local MLB team will do its best to accomplish the same thing 81 times in market and 81 more times on television. The lack of MLB in Portland, Orlando, San Antonio, Sacramento, Indianapolis and Louisville is an important factor why all six markets have been among the attendance leaders in their respective professional soccer leagues. Cincinnati’s success shows that the existence of pro baseball should not, by itself, rule out a new market. Size: In 2003, when we were planning the Chicago Fire’s Toyota Park, Bob Bradley advised me to err on the lower side of our estimated capacity range in order to ensure seat scarcity. This philosophy, combined with the ability to expand inexpensively with temporary seating, is wise. Sellouts beget more sellouts and help create a sense of importance and success. Location and accessibility: Urban venues in or near city centers have proven to be successful in Portland, Seattle, Toronto, Vancouver, Houston, and other markets due to proximity to restaurants, bars and shopping. They also tend to be easily accessible by public and private transportation. Amenities: Suites, stadium clubs, group party areas, protected concourses, paved parking, and other amenities aren’t just conveniences for fans—they are also important revenue opportunities that allow teams to monetize the game day experience. Configuration: Stadium configuration plays into the fan experience. Most outdoor, non-soccer-centric stadia in the U.S. are designed for American football and can easily be configured for soccer. However, a running track may limit field width, which negatively affects the quality of the soccer, and will likewise keep fans father away from the action. Baseball stadiums also restrict field dimensions, and they bring additional costs—and injury risk—when you account for sodding or playing over the infield. Sight lines designed for baseball are generally poor for soccer. Advertising: All venues come with advertising agreements that determine inventory and the product categories that can be sold. Onerous restrictions on advertising at Soldier Field, for example, is the issue that delayed MLS’s launching in Chicago until the League’s third season. Tenants: Sharing a venue with other tenants invariably limits usage for games and possibly office space, storage, and practice facilities. Scheduling around other tenants can be difficult and may negatively impact revenue. Creating a tribal mentality in support of a new team is very difficult. New teams don’t have the benefit of multiple generations passing on their love of the team. Instead, that passion needs to come from newly developed emotional connections between club and community. One of the best ways to jumpstart that emotional connection is to brand the club as a manifest representation of the community itself. If done properly, and with the community’s inclusion in the process, the engagement will be successful. This is also made easier when the residents of the community share a deep local identity that is passed down from generation to generation; markets with a higher homegrown population (people who reside in the state where they were born) tend to buy into local sports teams quicker and more passionately. Conversely, markets with large transient populations must overcome existing fan biases and a weaker overall commitment to local culture. 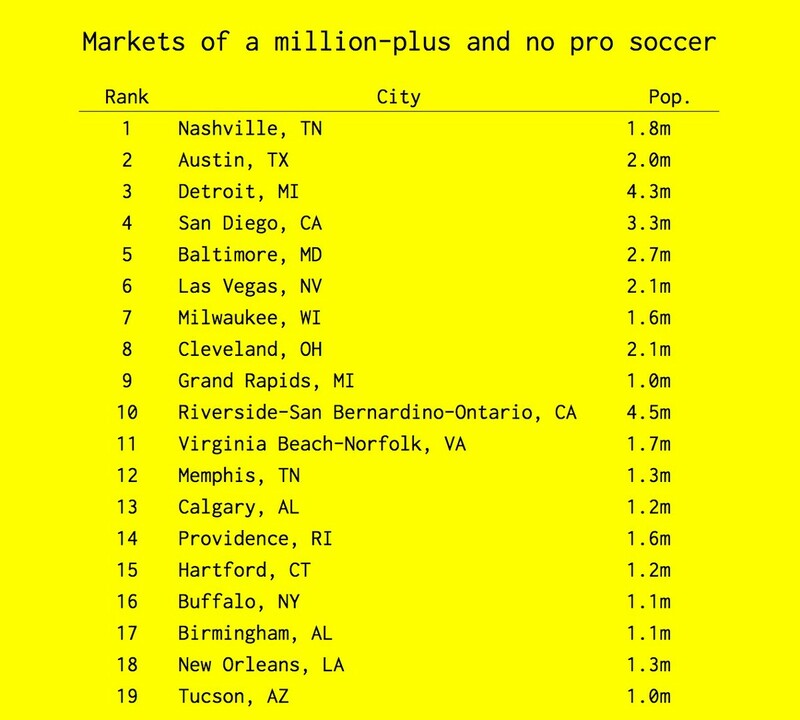 Cleveland (75% homegrown), Detroit (74%), and Baltimore (69%) are three markets with more than 1.5 million people and no professional soccer team. 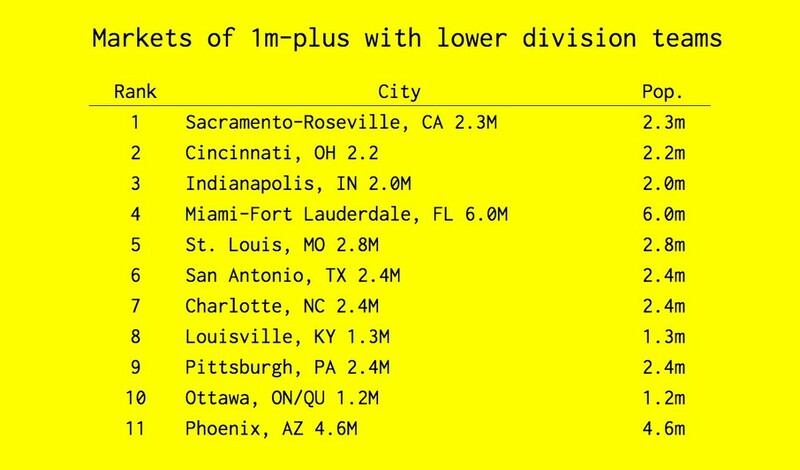 Million-plus cities that already have soccer teams like St. Louis (68%), Cincinnati (70%), and Indianapolis (70%) are all strong candidates to move up to a higher division. New professional soccer teams can also benefit from a high immigrant population. Most immigrants, especially those from Mexico and other Latin American countries, bring a love of soccer to the US. While this intuitively seems like a natural fan base for a new soccer team, it is important to note that new Americans also bring a love of another soccer team with them — usually the local team in their native country. It is unlikely that most new Americans will ever change their top allegiance to the new team, but with proper outreach, the new team can become their second favorite team and also receive their support. Also, their children and their children’s children are great candidates to support the new team. There are big cities in the West and Southwest that have significant Latino populations but no soccer team. Latinos make up at least 30% of the population in Austin, Las Vegas, El Paso, Bakersfield, Fresno, Albuquerque, Oxnard, and Tucson. While this does not necessarily correlate to high rates of immigration—many Latinos have been living in these cities for generations—it does suggest that professional soccer has so far steered clear of some large urban areas where people may already have a more pronounced cultural appreciation for the game. The millennial generation is driving the current wave of American soccer support. While they are not yet the majority of attendees, they are closing in. Importantly, young adults are driving the passion for the sport, the active support in the stands and the conversation about the local teams online and in the community. Young adult fans have been responsible for the amazing fan experience in Portland and Seattle in MLS, Indianapolis and Minnesota in the NASL, Louisville, and Cincinnati in the USL and many other teams throughout North America. Austin, San Diego, Virginia Beach, Madison, Honolulu, Bakersfield, and Baton Rouge are all places where 20-to-30-year-olds make up at least 30% of the population—and none has a pro soccer team. Some people deride the importance of youth soccer participation as it relates to professional soccer attendance. It is true that playing a sport does not equate to the person’s desire to watch the sport in person, on television or online. However, playing soccer is usually a person’s introduction to it and will usually lead to them sampling soccer as a spectator sport. Many other factors will determine whether or not the spectating interest will grow from casual observer to engaged fan, but the more people playing soccer locally, the more likely there will be a strong base of support for the local professional soccer team. And while young adults rightly get much of the attention for the sport’s spectator growth domestically, youth soccer families still buy the most tickets — and usually the most expensive tickets — to professional games. Ticket sales are the backbone of any sports team, but corporate partnerships are also critical. In professional soccer in the U.S. and Canada, the local revenue from broadcast, merchandise and ancillary stadium revenue still often lags behind sponsorship. While the effects of large market clutter that negatively impact ticket sales also hurt sponsorship, it is generally better to be in a market with more large businesses than fewer. The cities in the American based pro soccer leagues may have the most diverse climate of any Leagues in the world. The geographic size of the leagues is certainly among the most challenging in the world along with the Russian Football Premier League. Along with that size come markets that have widely varying temperatures and precipitation that impacts players as well as attendance. The Canadian markets of course are challenged with cold temperatures and snow in the early and late months of the season and the southern U.S. markets are challenged with unbearable heat during the height of summer. Rainy seasons in Florida and the Pacific Northwest also create challenges. Edmonton and Ottawa strive to avoid March and April home dates which creates home fixture congestion later in the season. Fort Lauderdale and other Florida markets have done the opposite — sought fewer games at the height of the summer hot and rainy seasons in exchange for crowded schedules at the beginning and end of the season. Phoenix and Las Vegas have struggled getting pro teams in the past in part due to extreme heat in the summer. Prior attempts at professional soccer in a market can add and subtract to the potential of a new professional soccer franchise. Unsuccessful attempts at pro soccer can lead to a community’s notion that the next attempt will also fail. While in theory all previous attempts failed since they no longer exist, some of these teams left a positive legacy. Some of these markets without professional outdoor soccer are having spectator success with collegiate, high level amateur soccer and/or professional indoor soccer. San Diego, Memphis, Buffalo and Hartford are current markets without pro outdoor soccer teams that have a history with professional indoor soccer. The original incarnation of the San Diego Sockers had a richer indoor soccer history than any other club with a record 10 indoor championships in their 16 seasons. Among the large markets that have tried professional outdoor soccer without success are Baltimore, Milwaukee and Cleveland. These three rustbelt cities all had tremendous success with indoor soccer and the Milwaukee Wave and Baltimore Blast continue as the two oldest continuous professional soccer franchises in the country. Cleveland had a rare run of soccer profitability with the Cleveland Force in the original MISL that averaged more than 11,000 fans five straight seasons from 1983–84 through 1987–88. It is not certain if the indoor soccer history is more likely to help or hurt a market’s potential for future outdoor professional soccer success. Amateur or semi-pro teams in Detroit, Nashville, Grand Rapids and Chattanooga regularly draw crowds of 4,000 or more for NPSL and PDL matches and have seeded their markets for professional soccer in the future. Among NCAA markets without pro soccer, Fresno State (1,501) and Creighton (Omaha 1,488) have the highest NCAA Men’s Soccer attendance since 1999. This is the fun part. Using the criteria above, let’s look at some specific markets where professional soccer would seem to have a good chance to flourish. Everything that follows is based on objective data and my own subjective interpretation based on personal visits to about two-thirds of the markets and my experience launching and managing professional soccer teams for the last three decades. The caliber of owner and choice of league are important variables, but we’ll set them aside for these rankings. 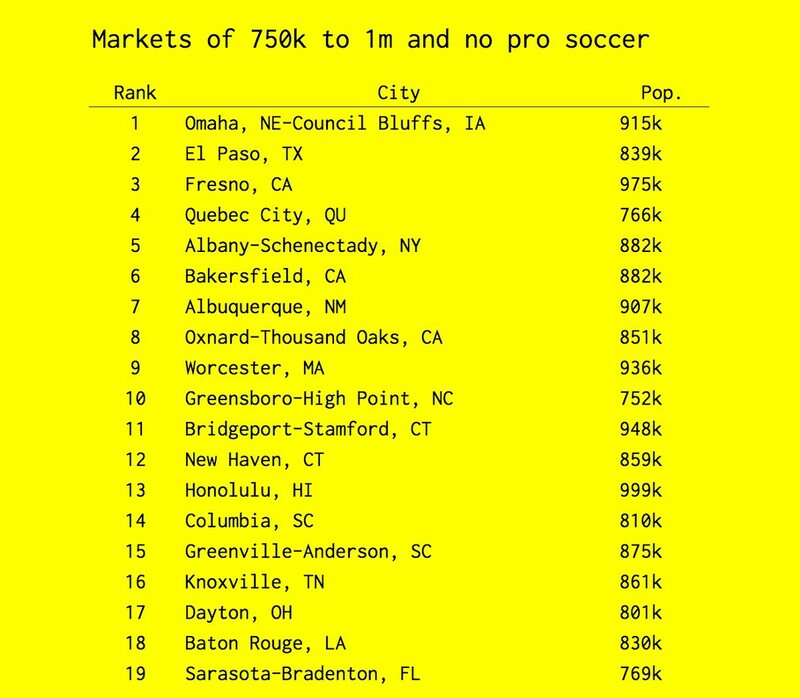 This is my ranking for markets of more than a million people that currently have no outdoor men’s professional soccer team. Austin and Nashville are very attractive expansion markets for similar reasons. Both are young, have large youth soccer programs, and limited professional sports competition— including no baseball. Austin’s Latino population (32%) is larger than Nashville’s (7%), but Nashville’s corporate base is larger (11 Fortune 1000 companies; only one in Austin). I waffled on which to put at the top, but landed on Nashville due to the available venue options. San Diego has more young adults, Latinos, and youth soccer participants than Detroit, but Detroit has more Fortune 1000 companies and homegrown population. Baltimore is attractive due to Maryland’s large youth soccer and Latino communities as well as a high percentage (69%) of homegrown population. Las Vegas isn’t ranked higher because the climate, small youth soccer base, and tiny homegrown percentage (23%) create some real challenges. Milwaukee and Cleveland appear objectively riskier than the six above them, but they are difficult to separate from one another. Cleveland has a larger population and higher homegrown population (75% to Milwaukee’s 66%), but Milwaukee beats Cleveland in young adult and Latino percentages as well as youth soccer numbers. In the end, my bias in favor of Milwaukee is easy to explain: I’ve lived there for more than three decades. It would be difficult to find two more dissimilar markets than Grand Rapids and Riverside-San Bernardino, yet they ended up ranked next to each other. The Inland Empire has a huge advantage over Grand Rapids in population (4.5m to 1.0m), Latinos (49% to 9%), and youth soccer numbers. However, Grand Rapids has a greater sense of self and commitment to the local community due to Riverside-San Bernardino’s smaller homegrown percentage (57% to 74%), proximity to LA and its professional sports teams, and limited unified local identity. I have less first-hand familiarity with the smaller markets. While I’ve spent time in 15 of the 19 larger MSAs, I’ve only been to 10 of the 19 smaller ones. Here’s the rationale for these rankings. Omaha is the jewel of this list. It has 10 Fortune 1000 companies and several terrific potential venues, including TD Ameritrade Park (24,505) and Morrison Stadium (7,500), and no competing major league sports. The demographics are solid. Population of 915,000, slightly higher than average homegrown population and an average age 2.5 years under the U.S. average. Five of the next seven in this list are driven by high Latino populations. El Paso (81%) and Fresno (52%) both have good homegrown population percentages as well. El Paso at 56% and Fresno at 64% indicate that many of the residents are second or third generation locals. (The U.S. average is 59% homegrown.) Average age for both markets is very young: 31.7 for Fresno and 31.8 for El Paso. The U.S. average is 37.7. The other three highly ranked Markets with high percentages of Latinos are Albuquerque, Bakersfield, and Oxnard-Thousand Oaks. Oxnard is ranked lowest of the three due to the lack of local identity—it gets lost in the clutter of Los Angeles. Bakersfield topped Albuquerque due to its higher homegrown (68% to 50%) and Latino population (52% to 48%), younger average age (31.2 to 37.6), and less competition from summer pro sports (single A baseball vs. the AAA Albuquerque Isotopes). 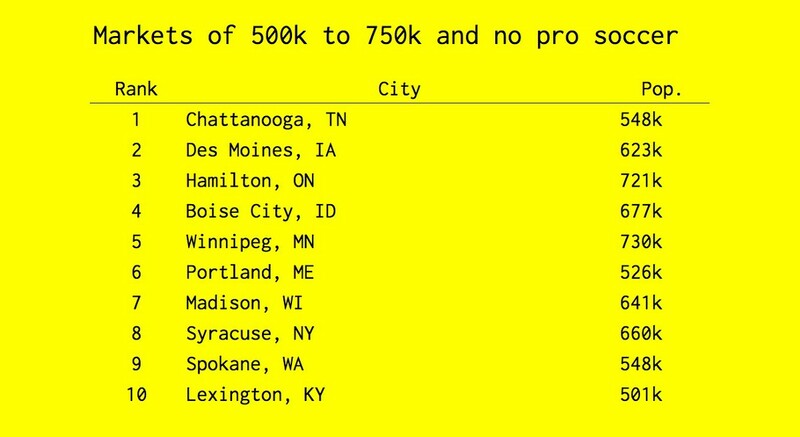 Chattanooga tops the small market rankings due to its impressive success with the amateur Chattanooga FC, which has set all kinds of attendance records in the NPSL. While averaging more than 4,000 per game in the regular season, the team earned national respect with record crowds of 8,878 and 18,227 respectively for playoff games in 2014 and 2015. Those numbers—as opposed to the demographic data in my MSA spreadsheet—explain why Chattanooga is ranked at the top. Among this group of 10 markets, Chattanooga ranks fourth in homegrown percentage, second in percentage of Latinos, and fourth in youth soccer membership. It is tied for sixth in millennial percentage. And it is the eighth oldest market. Chattanooga also plays in Finley Stadium, a beautiful 20,668-seat stadium with 32 sky boxes and a new in-fill turf field with the ability to erase football or soccer lines. Des Moines is next, again due to the positive track record of its existing amateur side, the Des Moines Menace. The Menace has played in various incarnations of the USL’s Premier Development League since 1994. The team has done well on the field and is usually among the League’s best supported teams with average attendance between 3,000 and 4,000 per game. Des Moines has the highest homegrown population in this group at 70% and is tied with the most Fortune 1000 companies at three. The Canadian markets of Hamilton and Winnipeg are the most populous in this group. Hamilton has a great CFL venue that would showcase a pro soccer team very well. I’m biased for Portland, Maine, and Madison, Wisconsin, because I’ve spent a lot of time in each and love them both. As the home of the University of Wisconsin, Madison has a very young average age (35.8) and high percentage of millennials (32%). Meanwhile, running a team in Portland is probably my dream retirement job. Maine’s coast in the summer and fall is one of the most idyllic places I’ve ever been. That doesn’t mean they would support pro soccer — and the data indicates it would be a real challenge — but trying to make it work would be a lot of fun. Not many years ago, it would have been considered ludicrous to suggest adding a second pro soccer team to any MLS market except New York or Los Angeles. New York now has three professional teams and Los Angeles has gone from one to two to one, and with LAFC’s entry to MLS, it will soon be up to two again. But there are now five MLS markets — counting LA — that could support an additional pro soccer team. In all cases, the ability to support an additional team is based on geography, population, and the proven draw of an urban venue with good accessibility and location. MLS teams in Chicago, Dallas, Boston, and Denver are actually in border communities: Chicago is in Bridgeview; Dallas plays in Frisco; Boston is in Foxborough; and Denver plays in Commerce City. While each of those teams is able to draw well in their locations, there is a greater desire among key demographics to attend games at an urban location. Chicago (Soldier Field), Dallas (Cotton Bowl), Boston (Nickerson Field and Harvard Stadium), and Denver (Sports Authority Field) all have existing venues that could serve as immediate urban venues for a new team. These locations are all more suitable to access via public transportation than their suburban rivals and could serve as short term homes while urban soccer-centric stadia are developed. Modular stadia near public transportation and active retail areas are also options to bridge the gap in a preferred location until a permanent home is solidified. 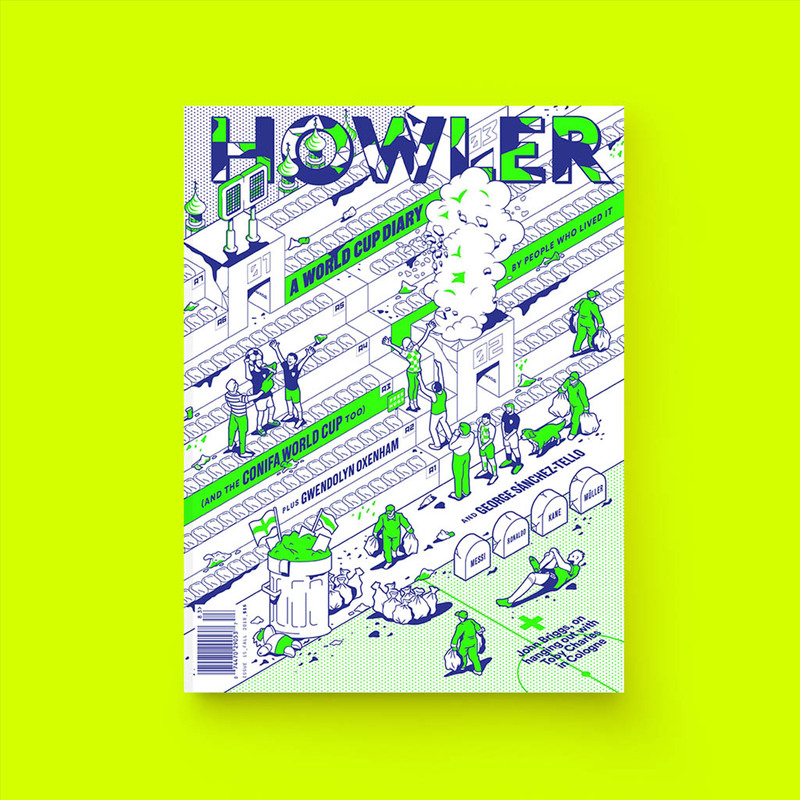 Due to its massive sprawl, Los Angeles offers multiple opportunities. Southern California’s population is so spread out that there are many different areas that could support a pro soccer team. The LA Galaxy’s home in Carson is in South Bay, 13 miles from downtown LA. The expansion LA FC will play its home games next to the LA Coliseum, which is in the same direction but only 2.5 miles from downtown LA. This leaves huge, well-populated areas to the north, east, and west of downtown LA and south of Carson in Orange County (home of the USL OC Blues) that could carve out their own market to support another professional soccer team in the area. In addition to urban young adult soccer support, a Dallas city-based team would benefit from increased Latino support. The Dallas Burn had a large Latino fanbase prior to abandoning the Cotton Bowl for suburban Southlake High School in 2003 for one season and again in 2006 as FC Dallas for suburban Frisco. Though they own the New England Revolution’s Gillette Stadium, the Kraft Family has long discussed interest in building a soccer-centric stadium in Boston. First to market with an urban team in the Hub will have an advantage to attract Boston’s considerable and crucially important young adult audience. Like Chicago, Dallas, and Boston, a team in downtown Denver — ideally in LoDo — would create a geographic advantage for attracting young adult active supporters. This would create an appealing identity that would fuel further support from other demographics and businesses. Unlike Chicago, Dallas, and Boston, however, Denver’s MSA population of 2.8 million may not be able to support two professional soccer teams. If there were to be teams in LoDo and Commerce City, the urban team would have an advantage over the suburban team to gain greater support in the long run. The only constant about American professional soccer landscape over the last 50 years has been change — change in markets and change in leagues. Perhaps the best part of the sport’s growth in the last decade has been its relative stability, especially with MLS’ measured growth and limited contraction. While there are still clubs that fold at all levels, it is becoming less common and promotion to higher divisions via checkbook is becoming more common. Portland, Seattle, Vancouver, Montreal, and Minnesota have all gone from second division to first division in the last decade by paying ever increasing expansion fees. With that in mind, the 11 markets listed here are all candidates to move up to a first division league. The top three candidates are all proving their markets’ ability to support first division soccer by supporting lower division soccer. In Cincinnati and Sacramento, FC Cincinnati and Sacramento Republic are packing in large crowds in the third division USL. In Indianapolis, Indy Eleven has led the second-division NASL in attendance the last two seasons. Miami is a unique case and proved very difficult to rank. A population of six million makes Miami the largest market in the country without a first division team, and its Latino population is very high at 43%. On the negative side is competition from other major league sports teams and two existing second division pro soccer teams. Many of Miami’s Latinos are Cuban, a group that does not traditionally support soccer, and its homegrown population is only 28%, the second lowest of the 64 markets ranked in this analysis. In addition to Miami, teams in Cincinnati, St. Louis, Pittsburgh, and Phoenix compete in the summer months with Major League Baseball teams for the hearts, minds, and wallets of potential fans. Researching for this article was enlightening. The potential for growth of professional soccer in the U.S. and Canada is tremendous and the research confirmed that contention. MSA statistical information for this piece was derived from www.governing.com, www.censusreporter.org, Statistics Canada, USYSA and Fortune Magazine. Additional sources for this article included www.kenn.com and The Midfield Press, which published a fantastic four–part series on American pro soccer expansion by Chris Kivlehan. Peter Wilt is a senior advisor to Club 9 Sports, where he facilitates Club 9’s global soccer relationships. He has launched teams in five professional soccer leagues, and those teams have won ten regular season, U.S. Open Cup, or post-season championships. His teams have also led four different leagues in season attendance. He has been honored as MLS Executive of the Year and inducted into several halls of fame, including the Chicago Fire’s Ring of Fire.